Pellegrino Food Products Co., Inc. 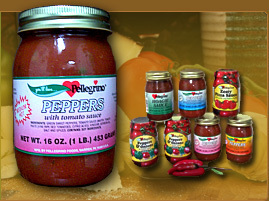 Ingredients: green sweet peppers, tomato sauce, vine ripe red tomatoes, vinegar, soybean oil, salt and spices. No cholesterol - No added sugars. For the person that likes a little zing in their sauce. In the food industry, all you can sell is the consistent quality of your product. "Our company started out in a small grocery store, where my parents sold peppers as a specialty item to hunters. We were the originator of the recipe to sell peppers in tomato sauce. Now, we're a USDA and FDA approved food processing company. It's still a family business with the same quality standards we had when we started." Here is a simple, fast, tasty and easy to make "Sloppy Joe"
Simply brown 1 - 1 1/2 pounds of Ground, Beef, Chuck or Sirloin. Drain any fat off. Add 1 Jar of Pellegrino Hoagie Sauce and heat through. Serve on your favorite type of roll or bun, or try an open face sandwich on your favorite bread. I love the Kyser Rolls. If you want to spice it up a little, or add a little zing to it try adding a few of your favorite Pellegrino Peppers either mixed in the sauce or just on top of your sandwich. Add your favorite chip and you have a tasty, fast and easy meal the whole family will love. Makes about 6 - 8 sandwiches depending on how much meat you use and what type of roll.